Are you an author in Ohio? Before you send your manuscript to any publishers, ensure it has been professionally edited by someone who knows what they’re doing. To help you find an editor, we’ve put together the following list. 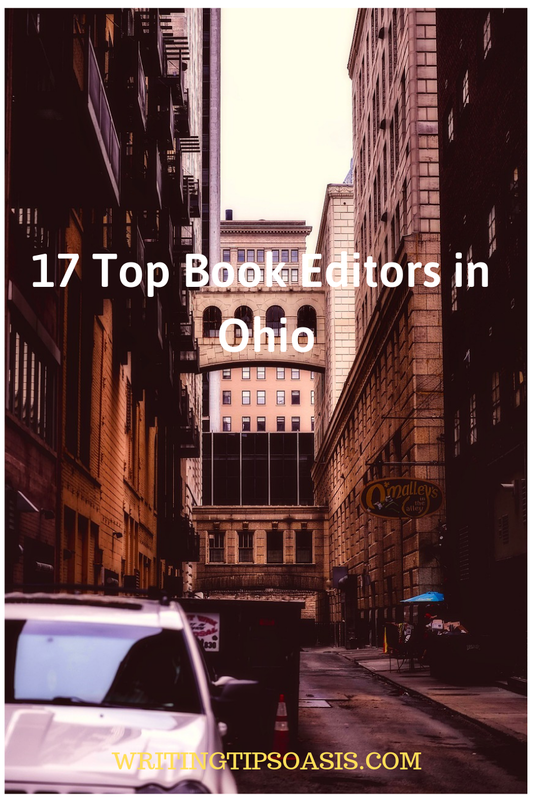 Below you’ll find 17 top book editors in Ohio. Miranda Miller is an Ohio-based freelance book editor who loves to work with all types of genres. Genre fiction that she particularly likes to work with include historical fiction, fantasy, science fiction, romance, post-apocalyptic/dystopian, drama, erotica, memoir, self-help, and more. Having earned a BA in English and over 13 years of editing experience, Miranda is also the founder and operator of Editing Realm where she offers services like developmental editing, line editing, copyediting, proofreading, manuscript critiques, and various combo packages. You can learn more about her services and rates on her website. If you’re interested in working with Miranda, you can reach out to her via email or through her website’s online contact form. Based out of Sylvania, Ohio, Rita Ray is a professional freelance book editor and founder of Proof It, an editing service. With a BA in English with concentration in Creative Writing, Rita is able to work with a wide range of projects, namely eBooks and blogs. Services that she offers includes proofreading, copyediting, and basic manuscript formatting. Her website offers a fantastic project estimate calculator that you can use to determine how much her editing services will cost. However, for a more accurate quote, Rita encourages you to send her a quick message either via email or through her website’s online contact form. Lori Paximadis is a freelance editor with over 26 years of experience in the field. As the founder of Pax Studio LLC, based out of Fairview Park, Ohio, Lori likes to work on nonfiction projects like memoirs, cookbooks, history, self-help, business, crafts, photography, religious studies, and pop culture. She also likes to work on romance fiction. Services that Lori offers includes copyediting, proofreading and cold reading, manuscript formatting, page makeup and layout, as well as project management. Since all projects vary in length, subject matter, and require different levels of editorial attention, Lori encourages you to reach out to her to request a project quote via email. Hailing from Fairview Park, Ohio, Katherine Harper is a full-time professional editor, writer, indexer and researcher. With a PhD in English, Katherine has worked on a wide range of academic projects, and is especially interested in those that explore topics like the arts, humanities, and social sciences. She has worked on projects like “Judge Thy Neighbor: Denunciations in the Spanish Inquisition, Romanov Russia, and Nazi Germany” by Patrick Bergemann, “For the Common Good: A New History of Higher Education in America” by Charles Dorn, and “60 Short Hikes in the Sandia Foothills” by Tamara Massong. If you’re interested in working with Katherine, you can send her message either via email or through her website’s online contact form to request more information about her services and rates. Based out of Cincinnati, Ohio, Melissa Wuske is a freelance nonfiction book editor who uses holistic editing methods to truly overhaul your manuscript and make it submission ready. With over 11 years of experience in the editing field, Melissa prefers to work on how-to, self-help, reference, and memoirs. Services that she offers includes developmental editing, content editing, line editing, and copyediting. Her services rates depend entirely on the project, so you’re strongly encouraged to reach out to Melissa either via email or through her website’s online contact form to request a free project quote. Be sure to include a brief description of your book, an approximate word count, and the approximate time frame you’d be willing to work within. Melissa should reach out to you shortly! If you’re an author of romance fiction, Christine Parker may be the book editor for you! As the founder of Chickadee Revisions, an editing service based out of Willowick, Ohio, Christine specializes in all things romance. She has worked on projects like “Starfish: A Rock Star Romance” by Lisa Becker, “Joy’s Daughter” by Spencer Margaret, and “Sonambulam” by Ryan Fitzpatrick. Services that Christine offers includes manuscript evaluations, developmental editing, stylistic editing, and copyediting. You can find more information about her services and rates on her website. If you’re interested in working with Christine, you can contact her either via email or through her website’s online contact form to get started. Andra Paitz is a freelance book editor from Cincinnati, Ohio. She is also the founder of 3C Scribe, an editing service geared toward independent authors. Andra personally loves to work on fiction projects, and primarily reads speculative fiction in her spare time. Services that she offers includes manuscript evaluations (starting at a rate of $0.001 per word), basic copyediting (at a rate of $0.005-$0.012 per word), and content copyediting (at a rate of $0.013-$0.024 per word). If you’re interested in working with Andra on your fiction manuscript, you can reach out to her either via email or through her website’s online contact form to request a more accurate project quote. Randall Drum is a professional editor and writer, as well as the founder of Drum Creative Services, which is based out of the state of Ohio. Randall prefers to work with literary fiction, namely horror, science fiction, and fantasy. As a fellow author with over 25 years of editing experience, Randall knows exactly what it takes to polish a manuscript so that it stands out from the competition during the agent or publisher querying process. Services that Randall offers includes content editing (at a rate of $0.02 per word), copyediting (at a rate of $0.01-$0.02 per word), and proofreading (starting at a rate of $0.006 per word). If you’re ready for the editing stage, but aren’t entirely sure what sort of service you need, Randall strongly welcomes you to reach out either via email or through his website’s online contact form to discuss your options. Brian Buckley is a freelance editor from Toledo, Ohio. As an official member of the American Copy Editors Society with experience working for clients like Creative Spark Writing, Pen-L Publishing, and Green Frog Publishing, Brian can easily apply his abilities to help copyedit your manuscript and make it ready for submission. He is capable of working on book-length manuscripts for both fiction and nonfiction, drama, poetry, short stories, essays, and more. Brian likes to work on a wide range of genres, including science fiction, Westerns, romance, fantasy, and more. If you’re interested in working with Brian, you can contact him via email to request more information about his rate and services, as well as request a free sample edit to get a better sense of his capabilities. Maureen Johnson is the founder of MoJo’s Indexing and Editorial Service, which is based out of the state of Ohio. Some of her previous clients include McGraw Hill, Microsoft Press, Pearson, Scholastic, and Prentice Hall. Maureen specializes in nonfiction and academic projects in subject areas like biology, business, chemistry, nursing, sports medicine, history, politics, and more. Maureen offers copyediting and proofreading services to identify and correct any issues she finds in your manuscript to give it a final polish. She also offers indexing and tagging services to make referencing easy for you. You can reach out to Maureen via email or through her website’s online contact form to get started. Based out of Mason, Ohio, Jill Hughes is a professional book editor and founder of The Editor’s Mark. With over 19 years of experience in the editing field, Jill has worked with clients like Perseus Books Group, Bloomsbury USA, Penguin Random House, Sourcebooks, Princeton University Press, Stanford University Press, and more. She is capable of working with both fiction and nonfiction projects. For a full list of all the projects she’s worked on, click here. Jill offers several editing levels, providing her services at varying degrees depending on her client’s needs. She offers light editing, standard editing, and heavy editing. For more information about her services and what each editing package includes, check out her website’s editing levels page. If you’re interested in working with Jill, you can contact her via email to request more information and a free project quote. Rebekah Cotton is a freelance editor from Cleveland Heights, Ohio. With over 26 years of experience in the editing field, 20 of which she’s spent freelancing, Rebekah specializes in academic manuscripts and memoirs, but is always open to working on different kinds of projects in the realm of fiction. She loves to work with university presses, self-publishing authors, nonprofit organizations, an academic writer. She’s worked on projects like “The Amazing Mr. Morality” by Jaco Appel, “The Climb from Salt Lick” by Nany Abram, and “Cleveland A to Z” by John Grabowski. Services that Rebekah offers includes copyediting and proofreading. If you’re interested in working with Rebekah on your book, you can message her either via email or through her website’s online contact form to request a free sample edit. She’s happy to provide a sample edit of up to 750 words for new clients. Be sure to include your project’s working title, its genre, an approximate word count, and your contact information to get started. Elisabeth Nelson is a freelance editor who specializes in romance fiction based out of Columbiana, Ohio. She has worked with a variety of publishers like Oxford University Press, Chalice Press, Royal Romances, and Relay Publishing. Services that she offers includes developmental editing and line editing (both starting at $0.01 per word), and copyediting (starting at a rate of $0.0075 per word). Elisabeth is more than happy to provide you with a free sample edit of up to 2000 words. For more information about her rates and services, you can check out the editing page of her website or find her profile on LinkedIn. If you’re interested in her editorial service, you can send reach her via email or through her websites’ online contact form. From Cincinnati, Ohio, Jana Riess is a freelance editor and writer with over 17 years of experience in the publishing industry. She prefers to work on projects of religion, spirituality, history, biographies, women’s studies, popular culture, and fiction. She has worked on projects like “Christian: The Politics of a Word in America’ by Matthew Bowman, “The Road Back to You: An Enneagram Journey to Self-Discovery” by Ian Morgan Cron, and “Post-Traumatic Church Syndrome: A Memoir of Humor and Healing” by Reba Riley. Services that Jana offers includes developmental editing and line editing, both of which start at a rate of $65 per hour for new clients. Since all books vary in length and complexity, it’s highly recommended that you reach out to Jana to request a more accurate project quote. Repeat clients receive discounted rates. If interested in working with Jana, you can reach her through her website’s online contact form. Based out of Bexley, Ohio, Maggie Smith is a freelance writer and editor, as well as the founder of Versed Creative Services. She specializes in academic texts and educational materials, but is always open to assisting authors with their fiction, nonfiction, drama, and poetry projects. As a fellow author, Maggie’s able to apply her experience of the publishing industry to assist her clients in making their submissions ready for the querying process. Services that Maggie offers includes manuscript consultations, copyediting, developmental editing and writing, and proofreading. If you’re interested in working with Maggie, she can be reached via email. Kendra J. Brown is a freelance editor, designer, and founder of Sassy Lady Design & Editorial, which is a service based out of Cincinnati, Ohio. Having graduated from Xavier University, Kendra has spent roughly 20 years in the publishing industry. Services that she offers includes content editing, manuscript clean-up and formatting, content correlation, document mapping, and log creation. She is happy to provide a sample edit of the first 2-3 pages of your project to give you a better sense of her editing style. For more information about her rates and services, you can contact Kendra via email or through her website’s online contact form. Rebecca Faith is the editor and founder of Faith Editorial Service, which is based out of the state of Ohio. With a background in biology, chemistry, and medical lab work, Rebecca is a technical editor who likes to work on projects of nonfiction and Christian content. Services that she offers includes copyediting (at a rate of $0.02 per word), proofreading (starting at $0.01 per word), transcription services (at $35 per hour), website evaluation (at $35 per hour), writing ($0.25 per word), and legacy projects to detail family history and childhood stories. For more information about her services and her rates, click here. You can also contact Rebecca through her website’s online contact form to request a more accurate project estimate. Are there any other book editors in Ohio that you’re aware of? Please tell us about them in the comments box below!